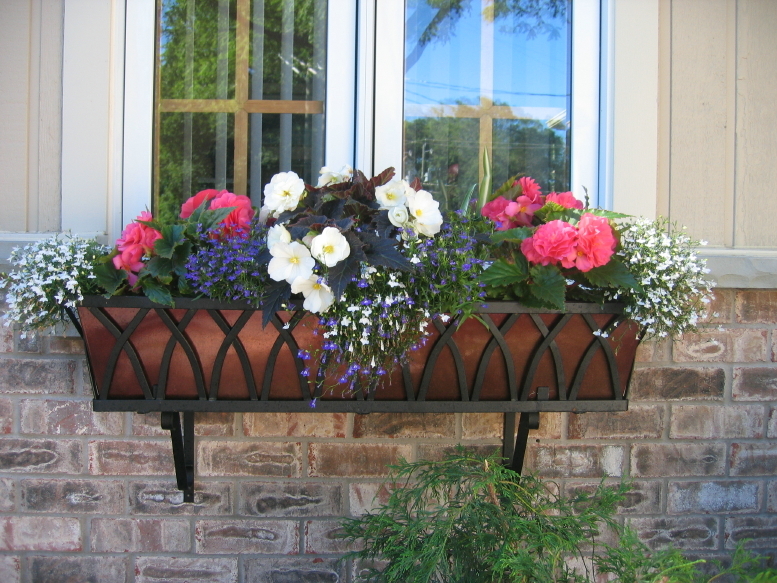 From the wrought iron window boxes of ancient France to the hayrack trough planters of traditional English cottage gardens, using planter boxes has long been a European tradition. In those days, the use was mostly utilitarian: they housed plants used for food and medicine. 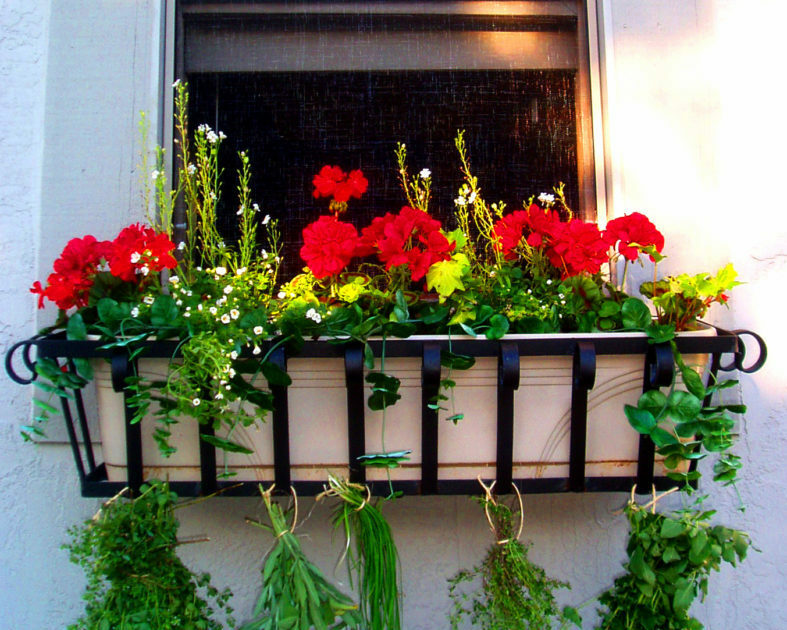 Now, window boxes are mostly used for home decoration, and some of these age-old window box designs are not only still available, but they’re still synonymous with that same Old-World European charm. The Arch Decora—This tapered window box has a pattern of arching black bars that criss cross around its elegant shape. The Venetian Decora—True to its name, this Italian-inspired window box has been handcrafted into a rustic window box with a Mediterranean scrollwork design. The Del Mar Decora—With an elegant crisscross pattern that finishes in ornamental scrolls, the Del Mar Decora provides an eye-catching backdrop for bright blossoms. 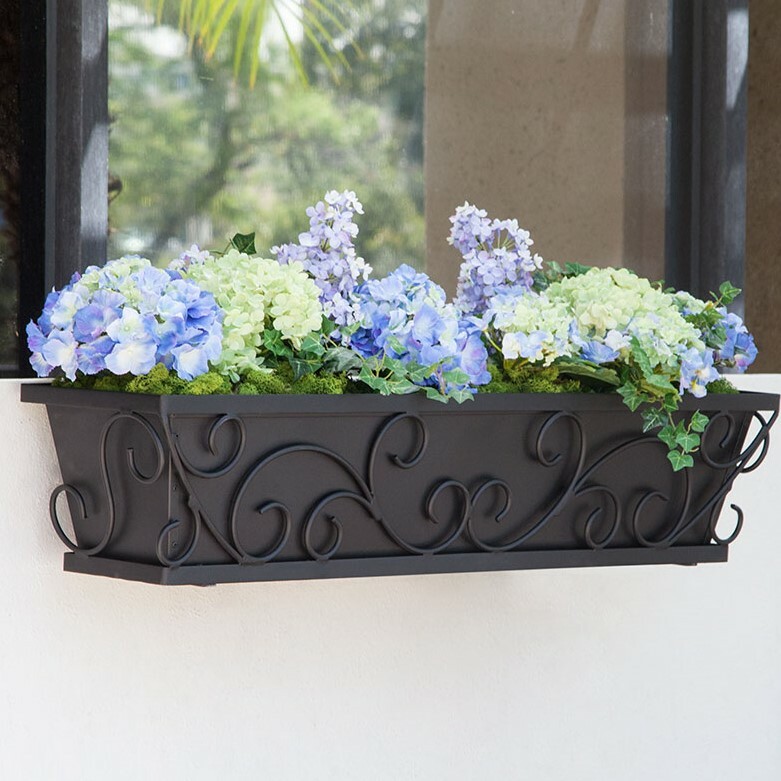 The NEW Regalia Decora—Our newest window box design, the Regalia has interlocking scrolls made of wrought iron, bringing a dramatic and romantic look to windows, porches, fences—anywhere you wish to mount them. Place a copper, vinyl, black, or white planter liner in them, or fill them with terra cotta pots for a classically Tuscan-style window treatment. The Santiago Decora—For a look that’s slightly modern, the Santiago mixes a tapered profile with a more contemporary grid design. The Medallion Decora—Classic meets contemporary in this wrought iron window box that bears a striking X pattern with a decorative medallion at its crosspoint. 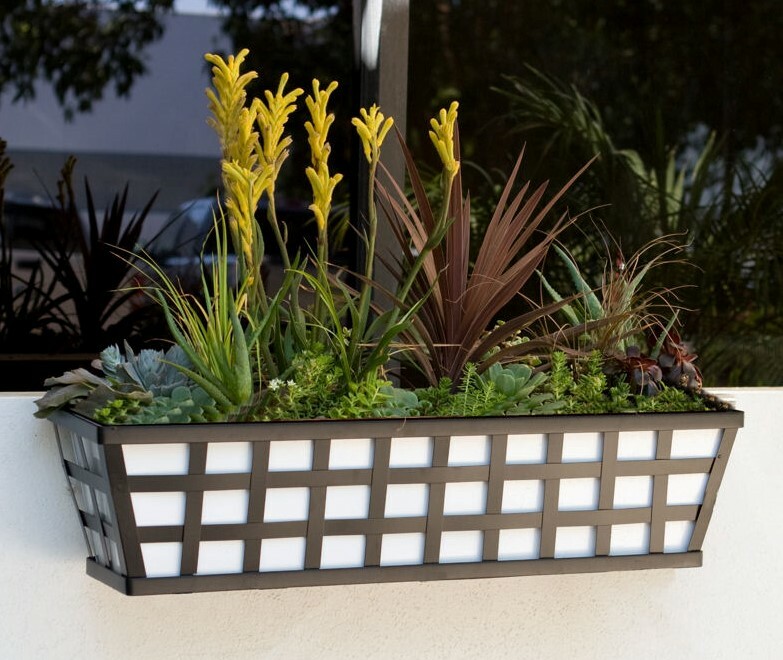 All of our Decora window boxes can be further customized in style with the variety of planter liners we offer, including powder-coated white, black, oil-rubbed bronze, bronze-tone, galvanized bronze with a hammered finish, and real copper. 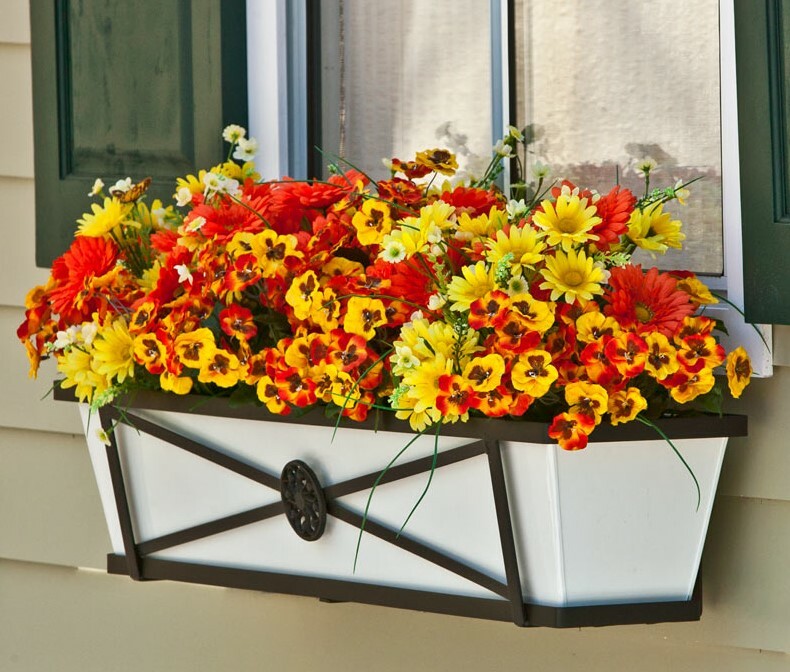 Go “across the pond” with your home décor with our traditional hayrack window boxes. 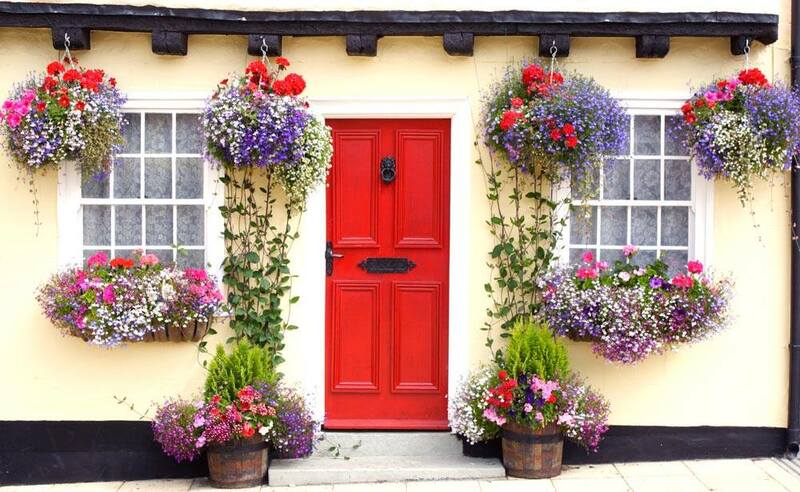 These country-style window boxes have adorned English cottages for centuries, and continue to add a warm, quaint feel to homes around the world. 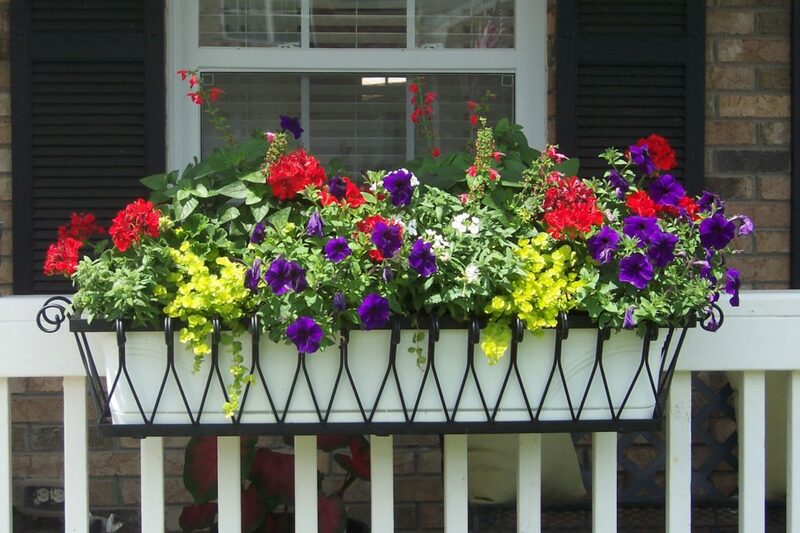 Our hayrack window boxes are available in a variety of sizes—even larger sizes up to 72″—including custom. 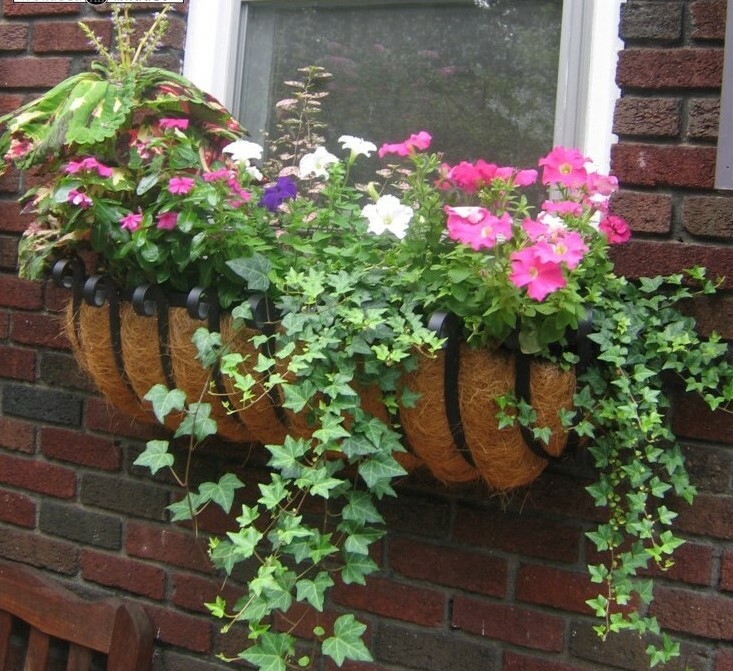 These traditional hayrack trough planters have a natural beauty further highlighted with our environmentally-conscious, 100% natural, real coconut coir liners that retain moisture and promote healthy plant growth.